The real highlight of this meeting was a custom gavel made and donated by Eldridge Tidwell to Mayor Jack Piper. The entire City Council was present along with the City Secretary. One citizen attended the meeting. Prior to the regular meeting, a public hearing was conducted on the proposed budget for Fiscal Year 2014, which begins on October 1. 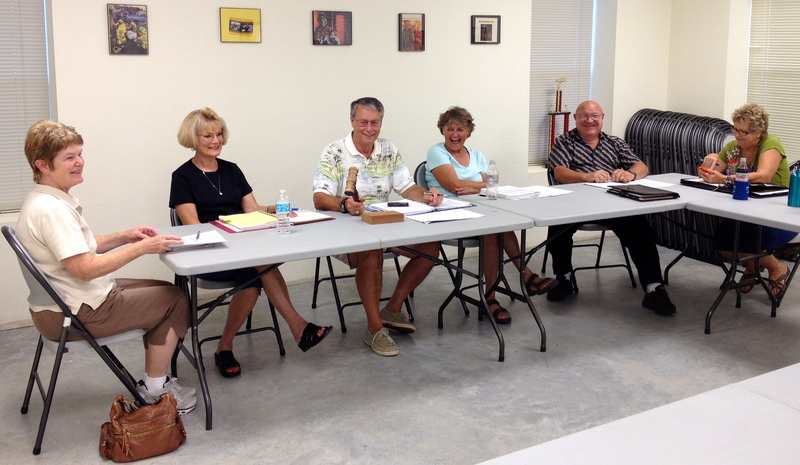 Mayor Piper reviewed the budget (see the story from September 3 for details on the budget). The only question from the public was related to road maintenance. Becky Sutton wanted to know whether or not Williamson County will take over maintenance on Pflugerville-Berkman Road (CR 459). Barbara Piper said that the council has not yet heard back from the county on this matter. There were no other questions or comments from the public. The budget will be formally adopted at the next regular meeting. Mayor Piper presented a financial report to the Aldermen. The beginning bank balance was $1,935.64 on June 26. Income was $1,415.93 (Liquor Tax Allocation). Expenses totaled $583.33 (checks, office supplies & equipment, Texas Municipal League Risk Pool). The ending balance as of August 30 was $2,768.24. Oncor expects to provide the information needed to establish an agreement for franchise fee revenue by October. Mayor Piper provided information on expected sales tax revenue in the event that the sales tax propositions are passed by the voters in November. Based on figures provided by the State Comptroller’s office, average state taxable sales within the City of Coupland during the period of July 2012 – June 2013 were $51,358 per month. This would result in general sales tax revenue of $629 per month ($503 for regular sales tax, $126 for road maintenance tax). During the Citizen Communication portion of the meeting, Becky Sutton asked a general question about how many readings are required for ordinances before they can be adopted. Mayor Piper responded that it depends upon the type of ordinance. He also noted that an extensive ordinance would not have to be read in it’s entirety but would be summarized and copies would be available to the public in advance. Ms. Sutton also asked how much Oncor will pay in franchise fee per meter. Mayor Piper that this figure is not yet known but that it will be in the contract with Oncor. The next regular meeting of the City Council will be on September 26. However, Mayor Piper has set a special work session for the Council to review and possibly revise a draft of a subdivision ordinance. This meeting will be on September 18 and will be open to the public. This entry was posted in Local Government, Opinion & Commentary, What's New? and tagged city council meeting, City of Coupland Texas, FY 2014 Budget, sales tax, subdivision ordinance, zoning ordinance on September 13, 2013 by Stewart Dale Spencer. 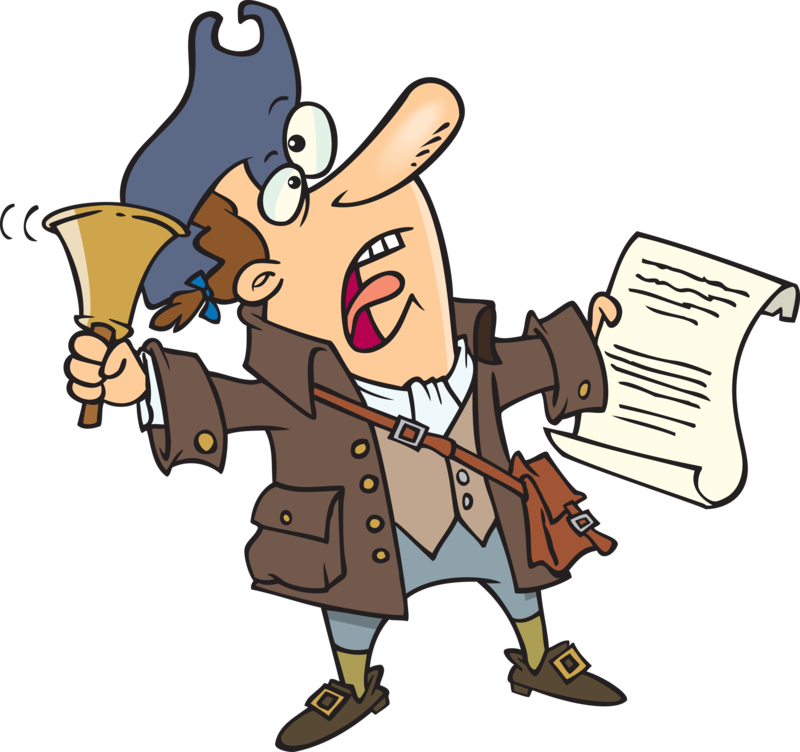 As per the requirements on Chapter 102 of the Texas Local Government Code, notice is hereby given that the Coupland City Council will conduct a public hearing on the proposed 2013-2014 Budget. This budget will raise established revenue from property taxes of $32,450. This meeting will be held on the 12th day of September 2013, beginning at 7:00 pm at the Coupland Volunteer Fire Station, 410 FM 1466, Coupland, Williamson County, Texas 78615. A copy of materials related to the item will be available at the Public Hearing and found on the website CouplandTimes.com. For further information contact Jack Piper, Mayor, at 512-856-2635. This entry was posted in Local Government, What's New? 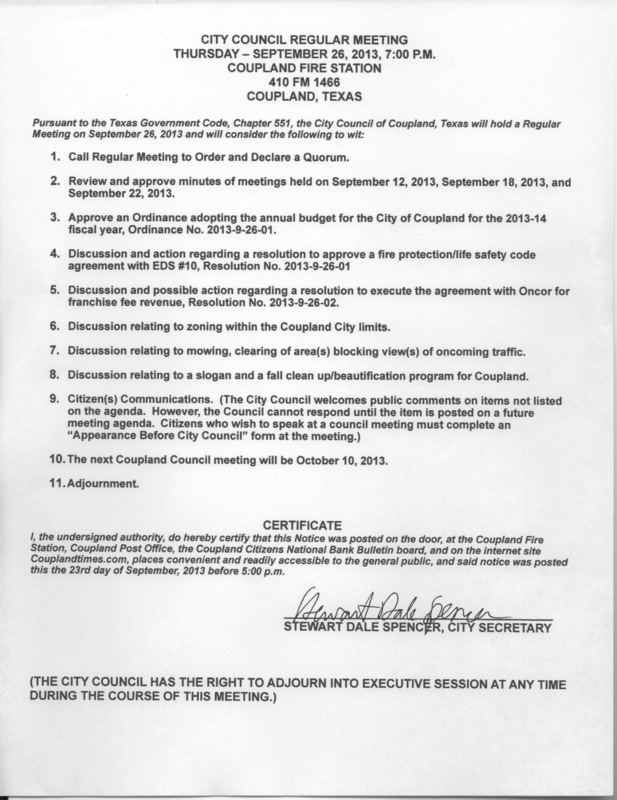 and tagged City of Coupland Texas, FY 2014 Budget, Public Hearing on September 3, 2013 by Stewart Dale Spencer.